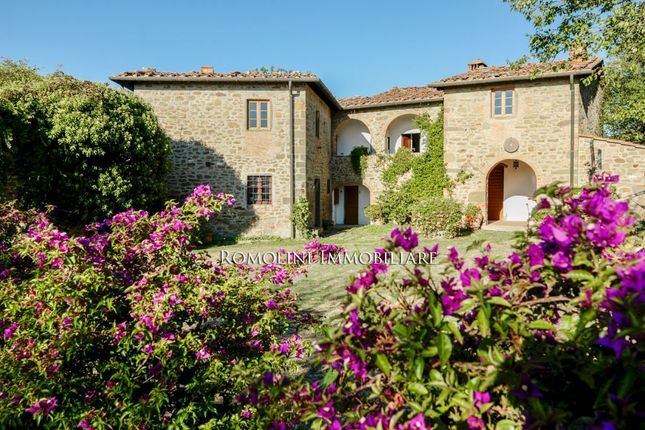 On the hills of the Tuscan countryside, in an extremely quiet location not far from Figline Valdarno, beautifully restored farmhouse with 40 hectares of land and swimming pool. Easily reached via a private unpaved road (3.8 km), the farmhouse offers a unique quiet and is provided with all the services, available in the nearby town of Figline Valdarno (8km; 20’). The location is particularly convenient since it allows easily moving throughout Tuscany and visit its most interesting towns: Greve in Chianti (16km; 30’), the Renaissant Florence (41km; 55’), Arezzo (53km; 1h), the beautiful Siena (59km; 1h 30’) and the medieval hamlets of Castiglion Fiorentino (71km; 1h 10’) and San Gimignano (71km; 1h 30’). The most convenient airports to reach the property are Firenze Peretola (58km; 55’), Pisa Galilei (118km; 1h 40’), Bologna Galilei (139km; 1h 45’), Roma Ciampino (264km; 3h) and Roma Fiumicino (279km; 2h 55’). - First floor: Living room, four bedrooms (two of which master bedrooms with four-poster beds) and two bathrooms. Next to the house is located a two-story annex. The farmhouse has been finely renovated, preserving unaltered those characteristics typical of Tuscan countryside buildings. The external walls have been cleaned and valorized, while on the inside wooden beams, terracotta floors, brick arches, stone fireplaces and wooden fixtures have been maintained. The access to the property is granted by a private unpaved road (2.8 km) decorated with cypresses in typical Tuscan style. The u-shape of the building creates a beautiful courtyard leading to the lower loggia with pizza oven. The 12 x 5 m swimming pool is located amidst pine trees, oleander trees and lavender bushes. An olive grove completes the property. At the edge of the property is located a nice pond which can be used either for swimming or rowing. The farmhouse, given the quiet and reserved location, is perfect for anyone looking for a house to escape the chaos of city life, spending days in the quiet only the Tuscan countryside can offer. Alternatively, it is always possible to use the building as B&B and/or agriturismo given its vicinity to Florence and the other wonders of Tuscany. Property descriptions and related information displayed on this page, with the exclusion of Running Costs data, are marketing materials provided by ROMOLINI - CHRISTIE'S, and do not constitute property particulars. Please contact ROMOLINI - CHRISTIE'S for full details and further information. The Running Costs data displayed on this page are provided by PrimeLocation to give an indication of potential running costs based on various data sources. PrimeLocation does not warrant or accept any responsibility for the accuracy or completeness of the property descriptions, related information or Running Costs data provided here. Via Trieste, 10/c, Anghiari, .